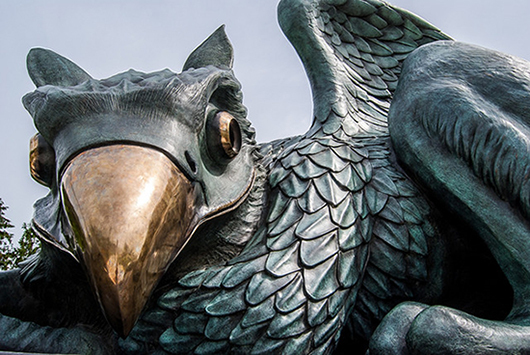 Visitors arriving at the main entranceway to the University of Guelph campus will now be greeted by a giant bronzed Gryphon statue unveiled today. 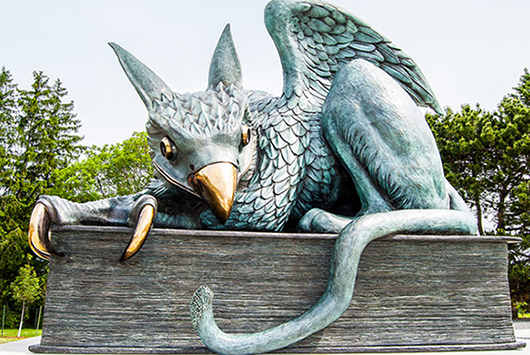 The Gryphon sculpture was revealed as part of Guelph’s 50th anniversary celebrations and Alumni Weekend. Designed by two faculty members and two graduates of the School of Fine Art and Music (SOFAM), the statue is located in a newly redesigned campus entrance at Stone Road and Gordon Street. A gryphon – the namesake of U of G sports teams -- is a mythical creature with the head, talons and wings of an eagle and the body of a lion. The new sculpture is illuminated by a nearby light standard containing a powerful LED light source. “The light is functional. It illuminates the sculpture and walkway, but it also signifies the illumination of learning and the University of Guelph as a special pathway to the acquisition of knowledge,” said Kim Kozzi, one of two faculty members who designed the sculpture. Kozzi and Dai Skuse, who also teaches in SOFAM, are the principals of FASTWURMS. They worked on the project with master of fine art graduates Nicole Vogelzang and Dustin Wilson. It took six months to research and develop, and a year of production and creative work in the studio and the foundry. FASTWURMS was asked by president Alastair Summerlee to take on the $300,000 project, which was funded entirely by donations, primarily from alumni and student groups. The duo previously designed a number of notable sculptures for buildings and developments in the Greater Toronto Area. “We were persuaded by Alastair’s vision of fostering the spirit of co-operation, the value of the greater good and giving back,” said Skuse. The sculpture was first conceived by the Ontario Veterinary College class of 1956, with alumnus Bob Liptrap and former OVC dean Ole Nielsen playing a lead role in pushing the project. The class raised $25,000 for the statue. The sculpture is a key piece of the U of G master plan, which called for enhanced signage to identify the University to campus visitors. This spring saw construction of stone walls bearing the university's name at Gordon Street entrances at both Stone Road and College Street. “We have a beautiful campus that we are all very proud of, but the reality is that there was nothing identifying the University to guests. We feel the signage and the Gryphon will change that,” said Summerlee. FASTWURMS tried to design a creature that would convey the complexity of the University, said Skuse. “The Gryphon is a strange hybrid creature, like mathematics and literature, logic and nonsense, academia and popular culture, eagle and lion,” he said.